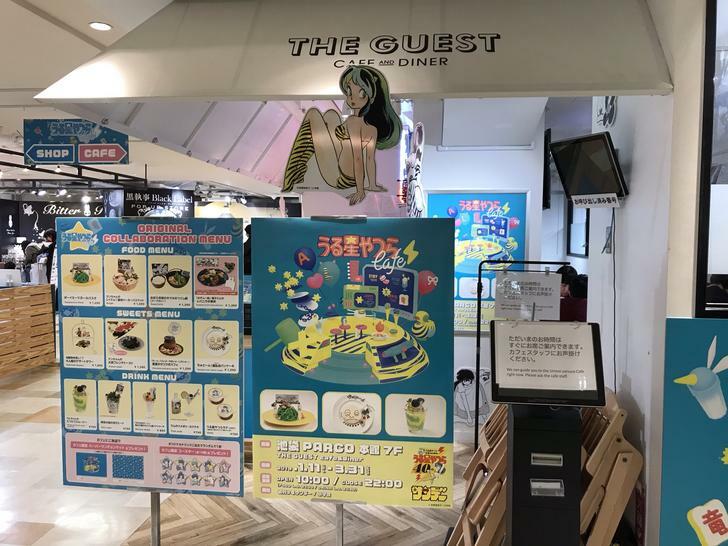 To view our full article about this café including full menu and other location details please click here: Urusei Yatsura Café Main Article. This café is only being held for a limited time within Japan from December 2018 until May 2019 so please be sure to visit while you can. We initially had a slight bit of confusion this time around from the fact that the building the cafe is in has a similarly named separate complex adjacent to the main one. We suggest taking the East Gate of Ikebukuro Station to find yourself immediately in front of the correct building. Once we arrived on the seventh floor of the building, the cafe was a small walk away before appearing in front of us, complete with adorable designs of the show adorning the outside walls and the entrance. We noticed the guidance placard at the entrance had English beneath them, which makes for a little more friendlier experience. Inside, the decor was alive with a projector and multiple TVs showing silent clips of the show with the sound system playing the opening tunes, and cutouts of the original manga’s panels and characters were dangling from the ceiling. The two items we decided on were the ボーイミールガールパスタ (Boy Meets Girl Pasta) and the「おれは女だーっ！」竜之介憧れのパフェ風バナナセーキ (“I’m a Woman!” Ryuunosuke’s Dream Parfait-Style Banana Shake). The banana shake came first to our table, complete in its cornucopia of fruits and whipped cream. The straw also had a double-sided card attached featuring a couple of panels from the manga. The latter pasta was a rather interesting looking dish with eye-catching green noodles and printed wafers of the characters complete with a paper banner completing the diorama-like depiction of the final scenes of the story. The cafe is a must visit for those of you that are fans of Takahashi Rumiko’s work, and especially Urusei Yatsura in particular! We the staff had a good time reminiscing when we were younger watching the anime reruns (all the staff are too young to have seen it during its original airing), and one staff in particular loves the story and tropes it has all too much. If you happen to be in Japan, give it a visit before it ends on March 31st!